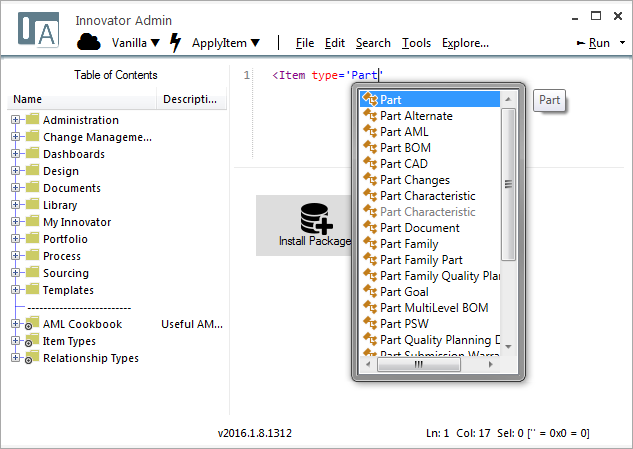 Innovator Admin is a Windows tool for querying and administrating Aras Innovator. It features an advanced AML query editor with full intellisense, smart expand/collapse of AML elements, tabular AML output, and more. It also has streamlined tools for exporting solutions from one database and importing them into another (e.g. for DEV to PROD migrations). These tools make it easy to identify dependencies in exports and recover from errors during imports.